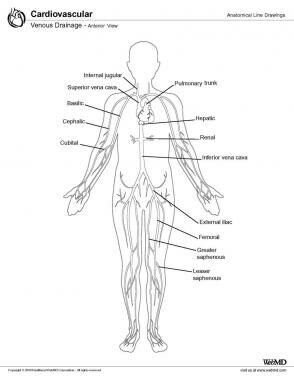 Grossly, the venous system is composed of venules and small and great veins, which serve to return blood from tissues to the heart (see the image below). The systemic venous system brings deoxygenated blood from tissues and organs back to the right atrium of the heart, whereas the pulmonary venous system brings oxygenated blood from the pulmonary circulation back to the left atrium of the heart. Veins have thinner walls and larger lumina than arteries do. Compared with arteries, veins possess a thinner tunica media, with little smooth muscle and elastic fibers, and are therefore more distensible. The thickest layer on these vessels is the outermost layer, the tunica externa, which is composed of networks of elastic and collagen fibers. Because of their thin walls and larger lumina, veins act as low-resistance capacitance vessels or blood reservoirs. Between 60-70% of the total blood volume is found in veins. Some veins, especially in the arms and legs, have valves that prevent the reflux of blood and aid in the return of blood against gravity. These valves are formed by folds of the innermost layer of the vein, the tunica interna, into the lumen. Venous return (VR) is the volume of blood that reaches the right heart. If the central venous pool is defined as the volume of blood contained in the great thoracic veins and in the right atrium, then VR can be considered to be the volume of blood entering this compartment from the periphery. Many factors and variables affect VR. If these variables are kept constant, however, VR is inversely proportional to the central venous pressure (CVP). Also, in hemodynamically stable conditions, VR is roughly equal to cardiac output (CO). The major factors that influence VR are the respiratory cycle, venous tone, the function of the right heart, gravity, and the muscle pump. During the respiratory cycle, as negative intrathoracic pressure is generated during inspiration, CVP decreases, thereby increasing VR. Negative intrathoracic pressure is transmitted to the great thoracic veins, and as the diaphragm moves downward, intra-abdominal pressure increases, thereby helping to move blood toward the heart. When intrathoracic pressure increases, these mechanisms are reversed. Venous tone affects VR by modifying the capacitance of veins and is primarily regulated by the autonomous system. As blood reaches the right ventricle, it is pumped out into the pulmonary circulation. When the ventricle contracts, it moves down and pushes blood out, and because the great vessels hold the heart in place, a mechanism of “cardiac suction” ensues, drawing blood into the atria. As blood fills the atria, the atrial walls stretch and atrial pressure decreases. Gravity affects VR by establishing a gradient between the intrathoracic venous compartment and the lower or dependent extremities. For each centimeter below the right atrium, venous pressure increases by about 0.75-0.8 mm Hg. Venous pressure at the level of the ankle in a person standing at the upright position is about 90 mm Hg. The effect of gravity on venous pressure is such that it causes blood pooling in the legs, and if a person stands quietly for a prolonged period of time, fainting may occur despite compensatory mechanisms. This effect is due to a reduction in the perfusion pressure of the brain. In contrast to venous pressure in the lower or dependent extremities, venous pressure above the right atrium decreases in the upright position. The pressure in the neck veins is close to 0 mm Hg, and this low pressure causes them to collapse. However, the dural sinuses have rigid walls that prevent their collapse; consequently, they reach subatmospheric pressures (ie, < 0 mm Hg). Muscle contraction facilitates VR by compressing veins. The contraction and relaxation of the muscles surrounding the deep veins help push blood upwards. Valves prevent the reflux of blood back into the lower limb, thereby assisting the unidirectional flow of blood into the right atrium. This effect is known as the muscle pump. When lower limb muscles contract, the muscle pump can effectively reduce venous pressure in the lower limb to less than 30 mm Hg. The association between abnormal VR and various signs and symptoms has been recognized since the time of Hippocrates. Chronic venous insufficiency is estimated to develop in almost 50% of patients with major varicose veins. Chronic venous insufficiency is the result of impeded venous flow to the heart. In the lower extremities, when this occurs, the normal reabsorption of perivascular fluids by osmotic and pressure gradients is altered, leading to the accumulation of perivascular and lymphatic fluid, which causes edema and impaired oxygenation of the surrounding tissues. As a consequence, pain, cramping, restlessness, pigment changes, dermatitis, and ulceration may ensue. Several etiologic factors alter venous flow and thus may lead to venous hypertension. In the lower extremities, venous hypertension results from loss or disruption of the normal 1-way valvular system. This valve disruption can occur secondary to deep vein thrombosis, thrombophlebitis, or dilatation of the veins from other causes. When the perforator system of the lower extremities becomes incompetent, blood is shunted from the deep venous system into the superficial venous system. The shunting of blood toward the superficial system causes its veins to respond by dilating to accommodate the increase in flow, producing superficial valvular incompetence, which leads to the formation of varicosities. When pressure from the muscular contraction in the legs is transmitted to the superficial venous system and subcutaneous tissues in the upright position, the pressure in the cuticular venules may greatly exceed 100 mm Hg. The resulting increase in capillary dilatation and increased permeability is manifested as telangiectasia and venectasia. Venous hypertension has been demonstrated to destroy the venous valves that are present in the subcuticular vascular system; This destruction promotes the progression of the disease and exacerbates the hypertension, increasing the risk of ulcer development. Cornenwett, Gloviczki, Johnston, Kempczinski, Krupski, Freishlangt, et al. Venous disease: an overview. Rutherford RB, ed. Rutherford Vascular Surgery. 2. 5. Philadelphia: WB Saunders Co; 2000. 1907-1919. Koeppen BM, Stanton BA. Overview of circulation. Berne & Levy Physiology. 6th ed. Philadelphia: Mosby Elsevier; 2009. 298-291. Goldman MP, Guex JJ, Weiss RA, et al. Adverse sequelae and complications of venous hypertension. Goldman MP, Guex JJ, Weiss RA, eds. Sclerotherapy. Treatment of Varicose and Telangiectatic Leg Veins. 5th ed. China: Saunders Elsevier; 2011. 25-48. Koeppen BM, Stanton BA. Properties of the vasculature. Berne & Levy Physiology. 6th ed. Philadelphia: Mosby Elsevier; 2009. 330-369.